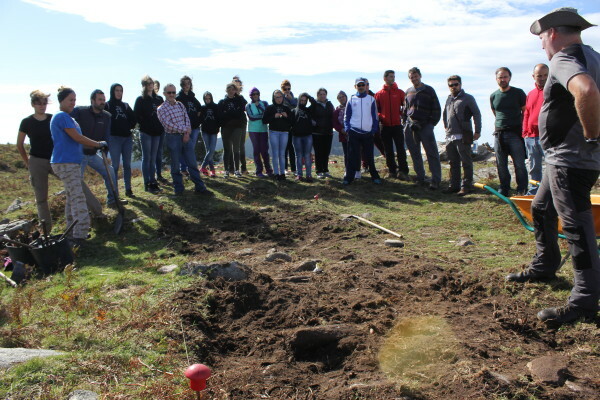 What happens on the first day of excavation at an Iron Age hillfort? Beer, bagpipes and bulls were not what we expected! The first day of excavation is always one full of anticipation. 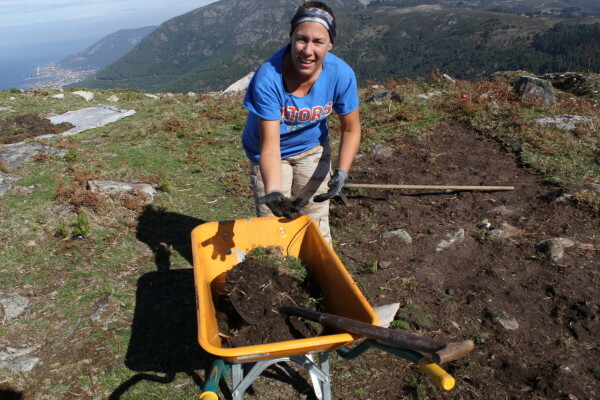 You are literally breaking new ground, or in our case tierra nueva. 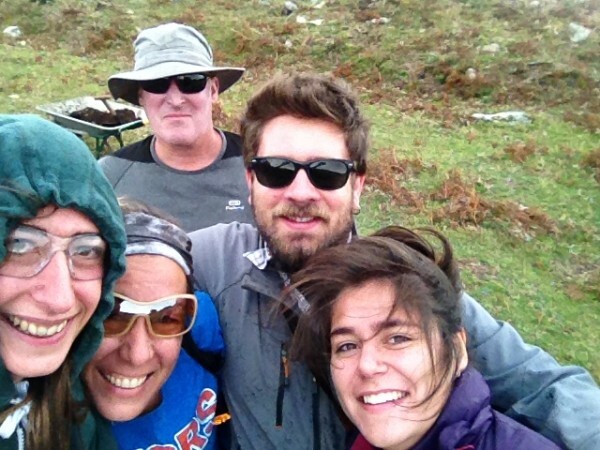 We are in Spain getting ready to dig an Iron Age hillfort and today is the first day of excavation. When we wake, it is still dark, but we are full of excitement. We can see our destination from the breakfast room: a rocky outcrop nestled ontop of a mountain that is otherwise thick with eucalyptus trees. We gulp down coffee, flick through the morning paper and pile into the 4×4 with our Spanish colleagues Xosé, Ursula, Carlos and Marta. Speeding up a winding track, we arrive just as the sun lifts itself over the mountaintop. We are 528m above sea level overlooking the Atlantic and the scene is breathtaking. The sun has just broken the horizon as we set up the Total Station to start mapping in the trenches. 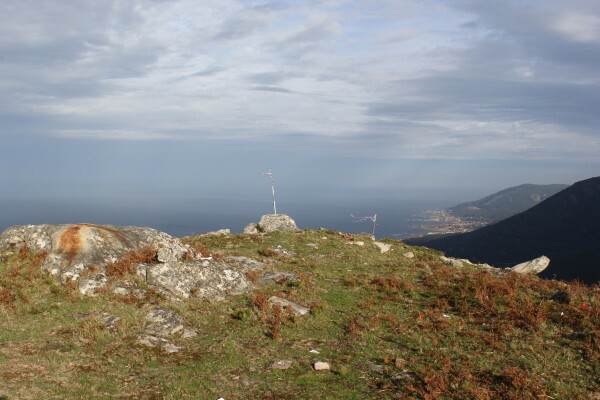 This is Chavella, one of a series of Iron Age hillforts that lines the Atlantic coast of Galicia. 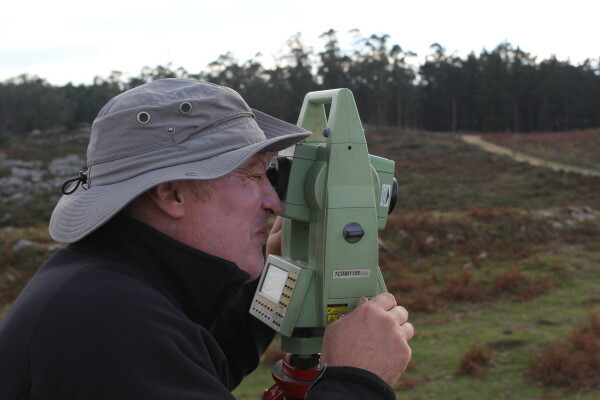 It is has never been excavated before, but its importance in the landscape is immediately clear. From here, extending north and south, you can see a series of semicircular ridges, each embracing a low-lying basin and capped with its own protective hillfort. To the west, there is nothing but the clouds on the Atlantic horizon. Standing on top of the acropole as the clouds part, looking north to A Cabeciña hillfort along the coast. Today, each of these valleys is home to a town whose residents collectively manage the surrounding land and they are coming together to research the ancient hillforts that line their coast. Up here, we can feel the wind and an exhilarating sense of the unique history we are about to uncover. These hillforts are emblematic of Spain’s Castro Culture, a way of living that emerged during the Bronze Age as tin was traded up and down the Atlantic coast from Ireland to Portugal, flourishing in the Iron Age before it was finally subsumed by the arrival of the Romans. 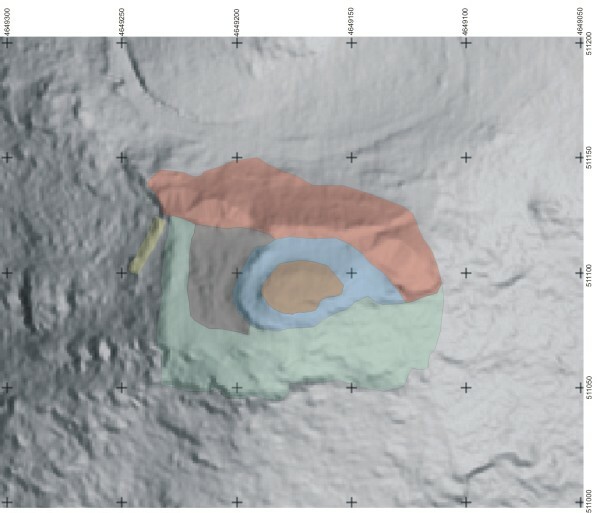 LIDAR map of Chavella hillfort. The acropole is in brown, the main terrace in blue. Like the hillforts we are familiar with in the UK, its builders enhanced naturally existing features, enclosing wide terraces with huge stonewalls on a monumental scale. The highest part is the acropole, the ultimate bastion in times of trouble, while the flattened terraces below would once have been crowded with buildings. The whole thing is surrounded by an outer wall, or ravettement, built with stone and which, despite some slumping over the millennia, still stands over 2m high. The scale of what we are about to begin is daunting. Chavella covers at least one hectare, and that’s before the slopes have been fully investigated, something that will only be complete after many years of fieldwork. But this is the first! And we are here to begin! So just how do you even begin to make a dent on such an enormous project? We’re starting with two trenches; one on the acropole, and one on the lower terrace. 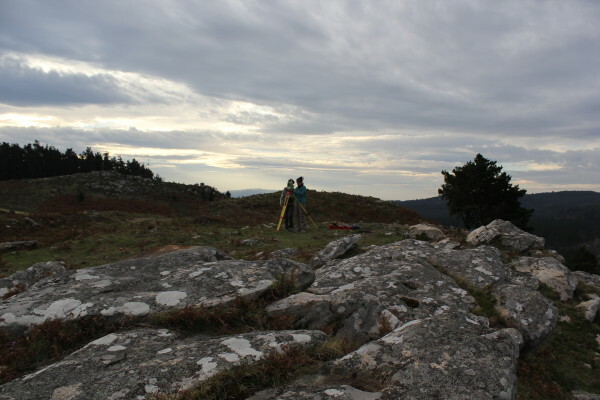 We lay out the trenches using a Total Station to map them in and use photogrammetry to make a 3D model of the surface. Soon, it is time to start stripping the topsoil. Every dig is different. 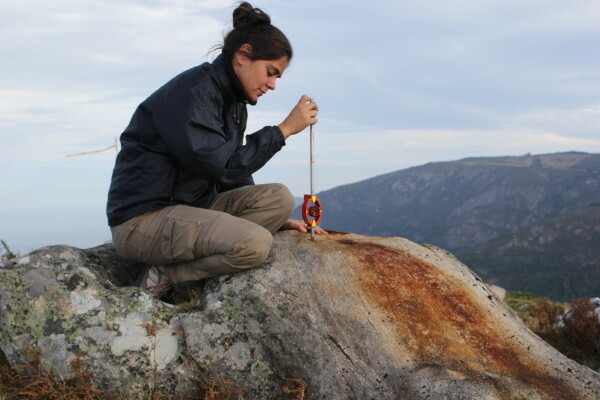 Even before you begin to consider the different artefacts, the different culture, the different chronology, however many excavations you have been on, there will always be a new field skills to learn, new conditions to cope with and new challenges to adapt to. And that’s before you even consider being in another country where everything from the soils, to the tools, to the language are different! Removing the sod, Lisa is amazed by the soil texture. It’s so different to the clayey soils we are used to! Almost immediately, it feels refreshingly new and unfamiliar. Anyone who has ever dug in the UK will be used to heavy, clayey soil, but here the soil is light and crumbly and full of bulbous roots. But that doesn’t necessarily make it easier to dig; sections are prone to collapse and if you’re not careful to dispose of your loose downwind, you will end up with a gob full of dirt! 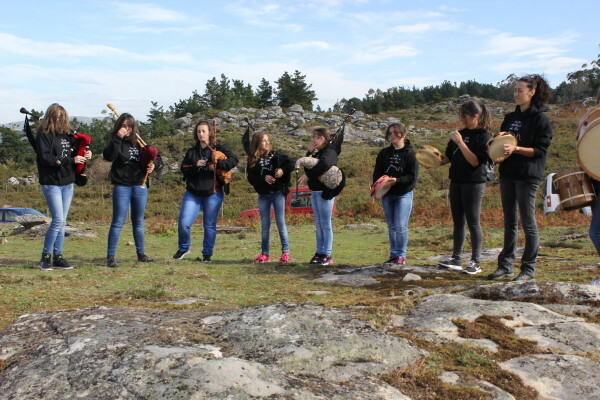 A traditional Galician band play bagpipes, tambourines and drums. Just out of shot, a herd of long-horned bulls approach. But there is something even more new for us to experience and that is the hospitality of the local community! 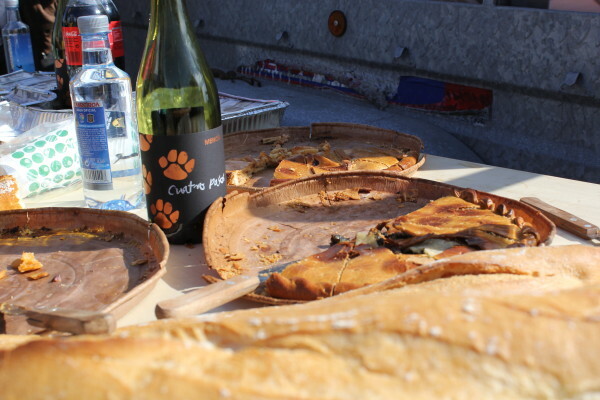 A car rumbles up the track with a trailer full of beer, wine, bread, chorizo, tortilla, three kinds of empanadas and a slow trickle of people coming up the path. It is lunchtime! Lunch! There are three kinds of empanadas, including one filled with tender squid in ink – a delicacy that Galicia has in abundance. This is co-operative archaeology, literally. Four land co-operatives from the surrounding area have united to make this project happen. Today is the start of a new excavation and it is wonderful to see that people care enough to drive all the way up a hill on a Saturday to celebrate the start of the dig. Members of the land co-operatives bring us lunch, and take a tour of the hillfort. Many of them have been coming here since they were children. There is a moment when it hits. This project is not just about the past, it is about what the past means to the people here today, to the four co-operatives who have united to make this project happen. For them, the past is a springboard to a better future and it is an honour and a privilege to be a part of it. The sun shone for as long as everyone stayed. There was clapping and cheering and one last song from the bagpipes. If only all archaeology were like this! We climb back up to the acropole, cheeks flushed with new energy and a little wine, but now the wind is howling across the exposed hilltop, blowing the topsoil into our eyes, ears and noses. Every time you empty your bucket, you have to fill it immediately so that it doesn’t disappear of the edge. And each time the wind changes direction, we have to adapt, making sure to have our backs to the wind so that the loose soil blows doesn’t clog up our eyes. We look at the spoil heap and are impressed with our work. Even more impressed when we realise half of it has probably blown away into the sea! After a few hours, we have stripped most of the topsoil to expose the tops of some large stones in close association with eachother… perhaps they are the remains of a collapsed wall? With the trenches open and our bellies full, we await just one more thing before we can start… the arrival of our intrepid Venturers! We cannot wait!